Originally I was going to make a blog post here and point the domain to it, but I decided the effort needed it’s own website, so it was my little project last night. We debuted it last night and started inviting people today. Tomorrow is International Judd Weiss Appreciation Day. Judd Weiss, who has many talents and many passions, happens to be a writer, a businessman, an entrepreneur, a hustler, and an incredible friend to many. He means a lot to me. He’s also The Photographer for the Liberty Movement. On his Facebook Photo Albums Page you can find over 50 albums dedicated to Liberty events (some of which he’s hosted himself!) and over 13,000 photographs of the beautiful and interesting people at these events. This 13,000 doesn’t even include a number of events he’s photographed recently or in the past that he hasn’t had a chance to sort through, edit and post. This 13,000 doesn’t include the photographs he painstakingly has to sort through and decide *aren’t* the top caliber for publication in his albums, but each one he takes and views with care before making his decision. 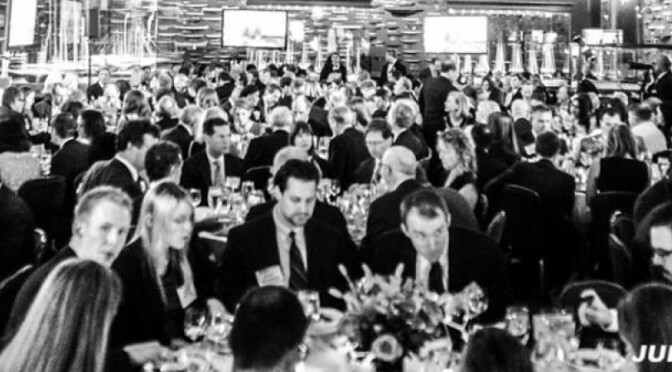 It’s a labor of love – he doesn’t charge for his work at these conferences and events. He’s been comped travel and hotel rooms and admission prices more recently, but he hasn’t asked the coordinators of these events for any fee for the photographs. It is his contribution to the movement. If you’re involved with the Liberty movement at all, you may have a photograph of yourself that was taken by him. Or you definitely know somebody who has. He’s responsible for THOUSANDS of Facebook Profile Pictures, as well as in cover photos, Wikipedia articles, and book jackets. His photographs have been featured in publications, on websites and in brochures. He makes the movement beautiful, and he’s never asked for anything from us in return. 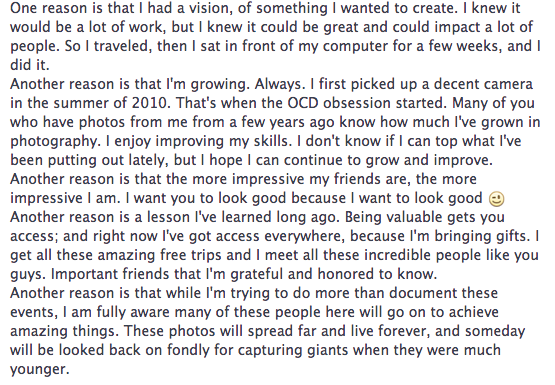 But some of us know the hours and effort that go into this incredibly positive, inspiring gift. Some of us *want* to give back, some of us who love the market are aware that time and effort and results are worth rewarding in ways the market understands. So join us. 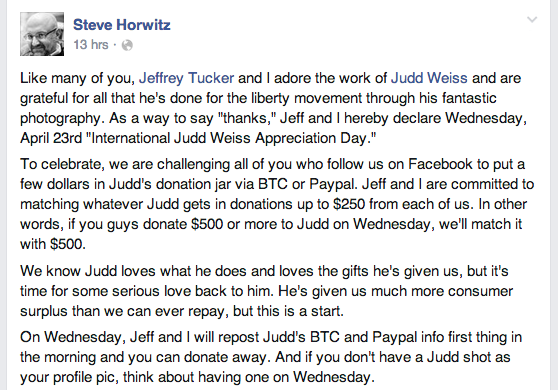 On International Judd Weiss Appreciation Day, April 23rd, 2014, join us in supporting the man who supports the movement. If every single person donated $1 for every photo they have of themselves, taken by him, there’d be at least $13,000, and that’s not even factoring in how many of his photos feature multiple people. Some people in the Liberty movement may not have much – considering some of his biggest albums are Students for Liberty or Young Americans for Liberty, but there are SO many of us, and any contribution, however small, can add to the tidal wave of love (and money) we wish to send his way. Myself, I’ve had hundreds of pictures taken by him, over 40 of my Facebook profile pictures are his, and I can’t afford to send him $1 per picture. But his Freedom Fest 2013 album of 759 photos featured 127 of me. So I’ll be giving him $127 on Wednesday. If you can’t donate, change your FB pictures to pictures he took, and show solidarity. Share the links, amplify the effort. I’m tremendously proud of him, and I’m so glad people in the Liberty movement see his value, appreciate him, and want to contribute to support his labor of love.